This letter, which Dr. Akenside says will probably be remembered as long as any of the bishop’s writings, has been lately given to the world by Mr. Malone, in the Supplement to Shakspeare." to Concanen, dated Jan. 2, 1726, very disrespectful to Pope, which, by accident, falling into the hands of the late Dr. Akenside, was produced to most of that gentleman’s friends, and became the subject of much speculation. 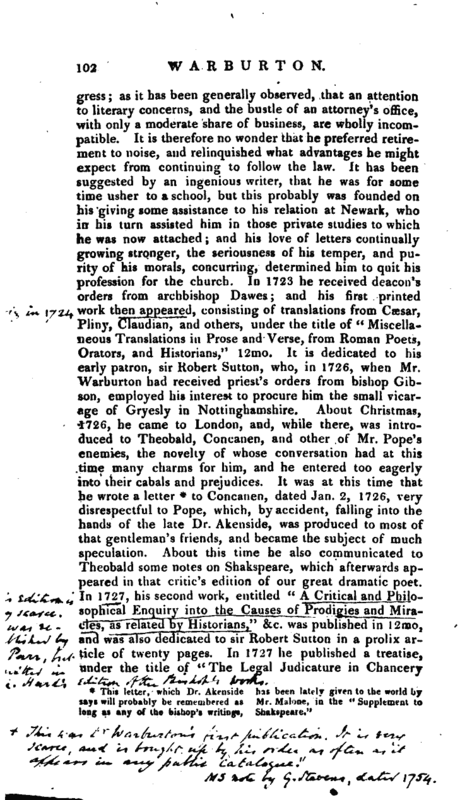 About this time he also communicated to Theobald some notes on Shakspeare, which afterwards appeared in that critic’s edition of our great dramatic poet. 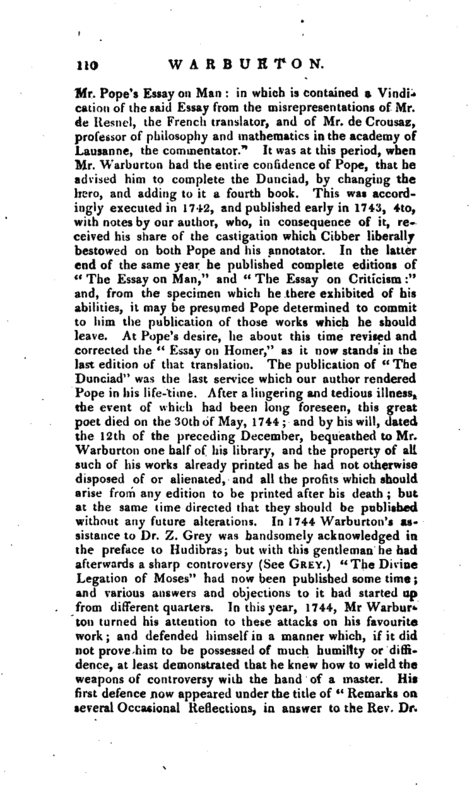 In 1727, his second work, entitled “A Critical and Philosophical Enquiry into the Causes of Prodigies and Miracles, as related by Historians,” &c. was published in 12mo, and was also dedicated to sir Robert Sutton in a prolix article of twenty pages. In 1727 he published a treatise, under the title of “The Legal Judicature in Chancery | stated,” which he undertook at the particular request of Samuel Burroughs, esq. afterwards a master in Chancery, who put the materials into his hands, and spent some time in the country with him during the compilation of the work. On April 25, 1728, by the interest of sir Robert Sutton, he had the honour to be in the king’s list of masters of arts, created at Cambridge on his majesty’s visit to that university. In June, the same year, he was presented by sir Robert Sutton to the rectory of Burnt or Brand Broughton, in the diocese of Lincoln, and neighbourhood of Newark, where he fixed himself accompanied by his mother and sisters, to whom he was ever a most affectionate relative. Here he spent a considerable part of the prime of life in a studious retirement, devoted entirely to letters, and there planned, and in part executed, some of his most important works. They, says his biographer, who are unacquainted with the enthusiasm which true genius inspires, will hardly conceive the possibility of that intense application, with which Mr. Warburton pursued his studies in this retirement. Impatient of any interruptions, he spent the whole of his time that could be spared from the duties of his parish, in reading and writing. His constitution was strong, and his temperance extreme; so that he needed no exercise but that of walking; and a change of reading, or study, was his only amusement. At least there was nothing published that can be with certainty ascribed to him. In 1732, his palron, sir Robert Sutton, having been a memher of the Charitable Corporation, fell under the censure of the House of Commons, on account of that iniquitous business. He was expelled the House, and his foi-iune for some time seemed to be holden but on a precarious tenure. On this occasion a pamphlet appeared, entitled “An Apology for sir. 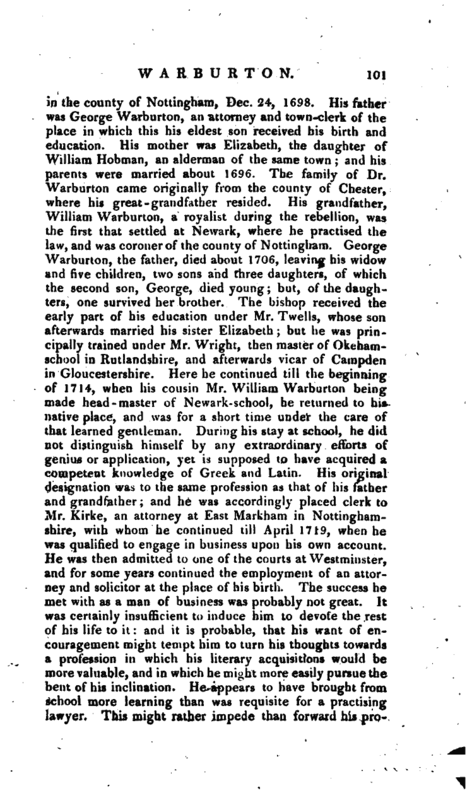 Robert Sutton,” It can only be conjectured, that Dr. Warburton had some concern in this produetion; but, when the connexion between him and sir Robert, and the recent obligation received from that gentleman, are considered, it will not be thought unlikely that he might,. on this oecasion, afford his patron some assistance by his pen. In the close of the first edition of the “Alliance” was announced the scheme of “The Divine Legation of Moses,” in which he had at this time made a considerable progress. 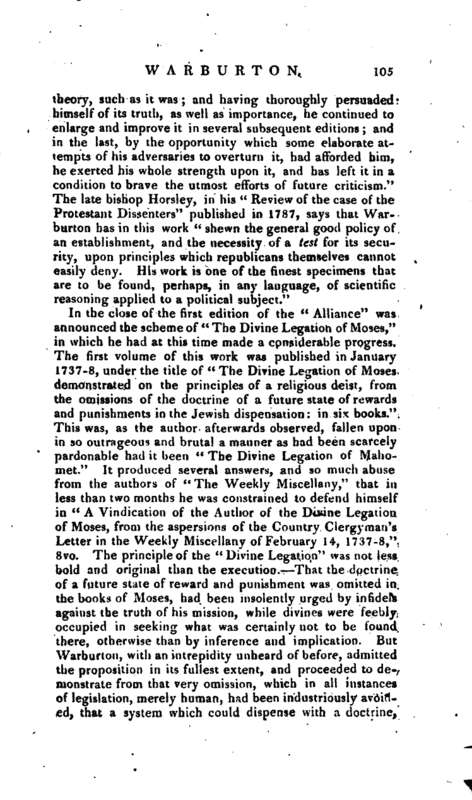 The first volume of this work was published in January 1737-8, under the title of “The Divine Legation of Moses demonstrated on the principles of a religious deist, from the omissions of the doctrine of a future state of rewards and punishments in the Jewish dispensation: in six books.” This was, as the author afterwards observed, fallen upon in so outrageous and brutal a manner as had been scarcely pardonable had it been “The Divine Legation of Mahomet.” It produced several answers, and so much abuse from the authors of “The Weekly Miscellany,” that in less than two months he was constrained to defend himself in “A Vindication of the Author of the Divine Legation of Moses, from the aspersions of the Country Clergyman’s Letter in the Weekly Miscellany of February 14, 1737-8,” 8vo. The principle of the “Divine Legation” was not less bold and original than the execution. That the doctrine of a future state of reward and punishment was omitted in the books of Moses, had been insolently urged by infidels against the truth of his mission, while divines were feebly occupied in seeking what was certainly not to be found there, otherwise than by inference and implication. But Warburton, with an intrepidity unheard of before, admitted the proposition in its fullest extent, and proceeded to demonstrate from that very omission, which in all instances of legislation, merely human, had been industriously avoided, that a system which could dispense with a doctrine, | the very bond and cement of human society, must have come from God, and that the people to whom it was given must have been placed under his immediate superintendence. But it has been well observed, that although in the hands of such a champion, the warfare so conducted might be safe, the experiment was perilous, and the combatant a stranger: hence the timid were alarmed, the formal disconcerted; even the veteran leaders of his own party were scandalized by the irregular act of heroism; and he gave some cause of alarm, and even of dissatisfaction, to the friends of revelation. They foresaw, and deplored a consequence, which we believe has in some instances actually followed; namely, that this hardy and inventive champion has been either misconceived or misrepresented, as having chosen the only firm ground on which the divine authority of the Jewish legislator could be maintained; whereas that great truth should be understood to rest on a much wider and firmer basis: for could the hypothesis of Warburton be demonstrated to be inconclusive; had it even been discovered (which, from the universal knowledge of the history of nations at present is impossible) that a system of legislation, confessedly human, had actually been instituted and obeyed without any reference to a future state, still the divine origin and authority of the Jewish polity would stand pre-eminent and alone. Instituted in a barbarous age, and in the midst of universal idolatry, a system which taught the proper unity of the Godhead; denominated his person by a sublime and metaphysical name, evidently implying self-existence; which, in the midst of fanatical Bloodshed and lust, excluded from its ritual every thing libidinous or cruel, (for the permission to offer up beasts in sacrifice is no more objectionable than that of their slaughter for human food, and both are positively humane,) the refusal in the midst of a general intercommunity of gods, to admit the association of any of them with Jehovah: all these particulars, together with the purity and sanctity of the moral law, amount to a moral demonstration that the religion came from God. Quarterly Review, No. XIV. 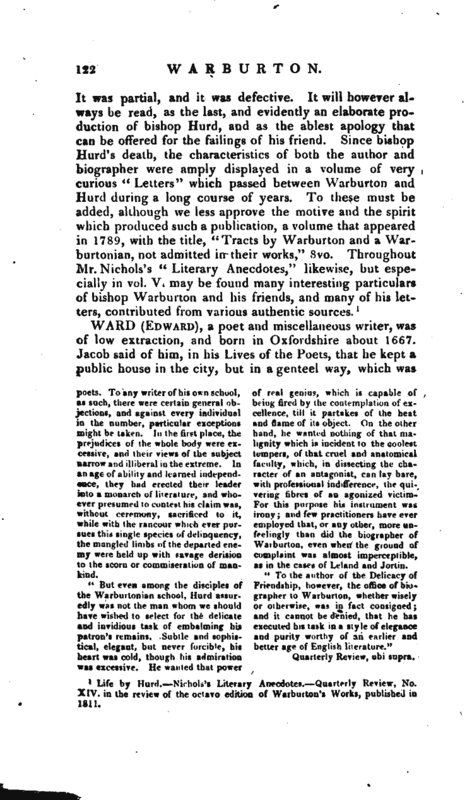 Review of Warburton’s Works, an article of uncommon ability, which we wish we were at liberty to assign to its proper author. is one of the few theological, and still fewer | controversial works, which scholars perfectly indifferent to such subjects will ever read with delight. The novelty of the hypothesis, the masterly conduct of the argument, the hard blows which this champion of faith and orthodoxy is ever dealing about him against the enemies of both, the scorn with which he represses shallow petulance, and the inimitable acuteness with which he exposes dishonest sophistry, the compass of literature which he displays, his widely extended views of ancient polity and religion, but, above all, that irradiation of unfailing and indefectible genius which, like the rich sunshine of an Italian landscape, illuminates the whole, — all these excellences will rivet alike the attention of taste, and reason, and erudition, as Jong as English literature shall exist while many a< standard work, perhaps equally learned and more convincing, is permitted to repose upon the shelf. But it is in his episodes and digressions that Warburton’S powers of reason and brilliancy of fancy are most conspicuous. They resemble the wanton movements of some powerful and half-broken quadruped, who, disdaining to pace along the highway under a burden which would subdue any other animal of his species, starts aside at every turn to exercise the native elasticity of his muscles, and throw off the waste exuberance of his strength and spirits. Of these the most remarkable are his unfortunate hypothesis concerning the origin and late antiquity of the Book of Job, his elaborate and successful Disquisition on Hieroglyphics and Picturewriting, and his profound and original Investigation of the Mysteries. 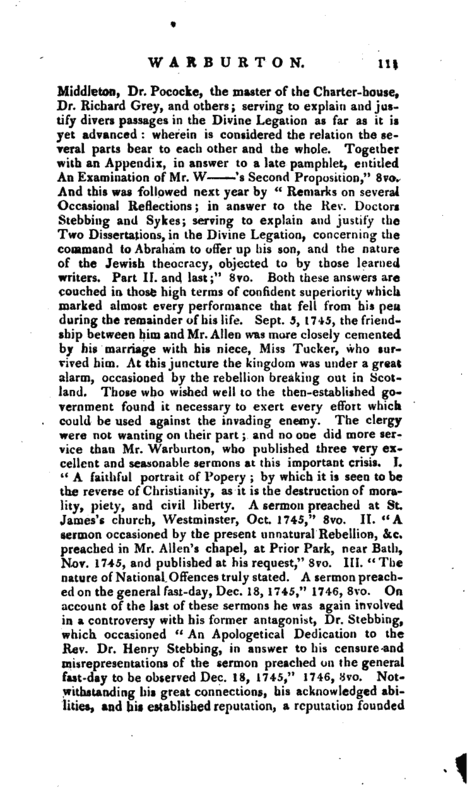 Mr. Warburton’s extraordinary merit had now attracted the notice of the heir-apparent to the crown, in whose immediate service we find him in June 1738, when he published “Faith working by Charity to Christian edification; a sermon preached at the last episcopal visitation for confirmation in the diocese of Lincoln; with a preface, shewing the reasons of its publication; and a postscript, occasioned by some letters lately published in the Weekly Miscellany: by William Warburton, M. A. chaplain to his royal highness the prince of Wales.” A second edition of “The Divine Legation” also appeared in November 1738. In March 1739, the world was in danger of being deprived of this extraordinary genius by an intermitting fever, which with some difficulty was relieved by a plentiful use of the bark. His reputation was now rising everyday; and he | about this time rendered a service tt> Pope, by means of which he acquired an ascendancy over that great poet, which will astonish those who observe the air of superiority which, until this connection, had been shewed in all Pope’s friendships, even with the greatest men of the age. The “Essay on Man” had been now published some years and it is universally supposed that the author had, in the composition of it, adopted the philosophy of lord Bolingbroke, whom on this occasion he had followed as his guide, without understanding the tendency of his principles. 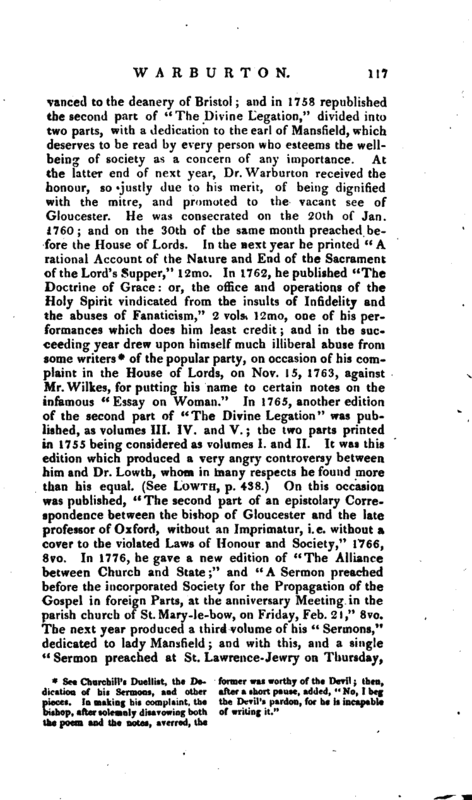 In 1758 M. de Crousaz wrote some remarks on it, accusing the author of Spinosism and Naturalism; which falling into Mr. Warburton’s hands he published a defence of the first epistle in “The Works of the Learned,” and soon after of the remaining three, in seven letters, of which six were pri.nted in 1739, and the seventh in June 1740, under the title of “A Vindication of Mr. Pope’s Essay on Man, by the author of the Divine Legation.” The opinion which Mr. Pope conceived of these defences, as well as of their author, will be best seen in his letters. 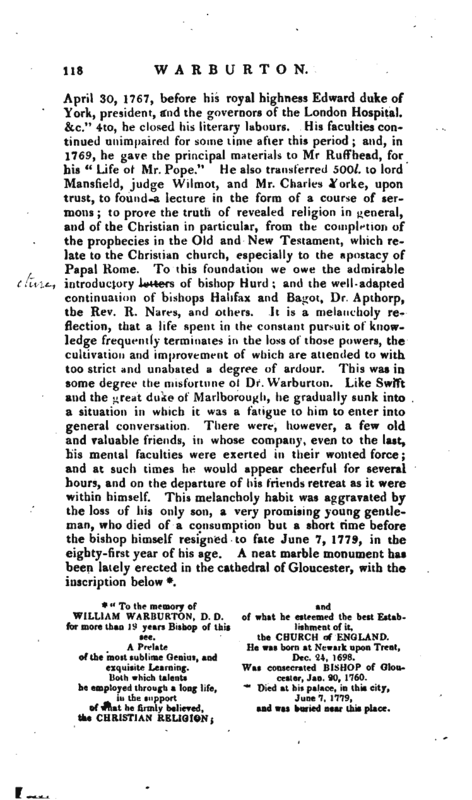 In consequence, a firm friendship was established between them, which continued with much undiminished fervour until the death of Mr. Pope, who, during the remainder of his life, paid a deference and respect to his friend’s judgment and abilities which will be considered by many as almost bordering on servility. 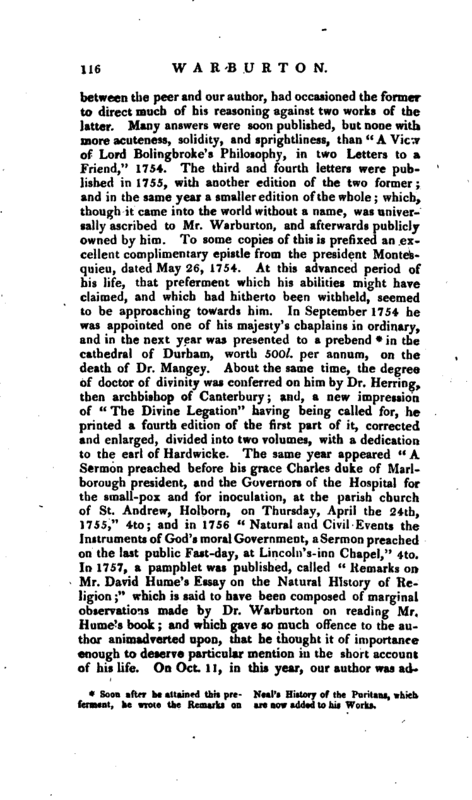 In 1741 the second volume of “The Divine Legation,” in two parts, containing books IV. V. VI. 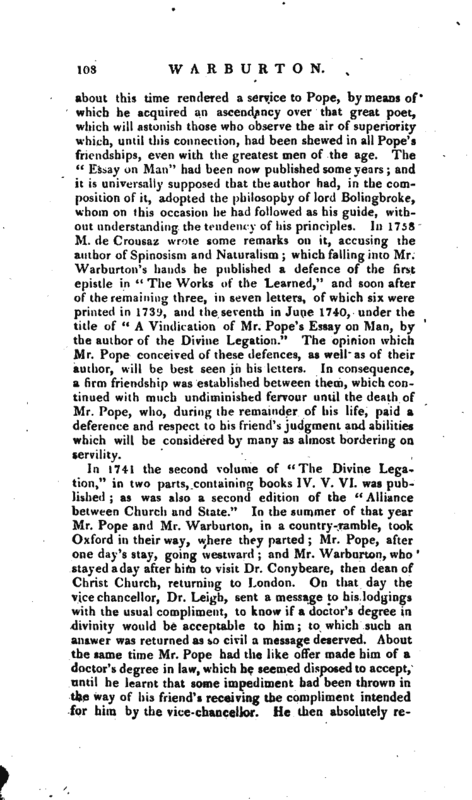 was published; as was also a second edition of the “Alliance between Church and State.” In the summer of that year Mr. Pope and Mr. Warburton, in a country-ramble, took Oxford in their way, where they parted; Mr. Pope, after one day’s stay, going westward; and Mr. Warburton, who stayed aday after him to visit Dr. Conybeare, then dean of Christ Church, returning to London. On that day the vice chancellor, Dr. Leigh, sent a message to his lodgings with the usual compliment, to know if a doctor’s degree in divinity would be acceptable to him; to which such an iuiiswer was returned as so civil a message deserved. About the same time Mr. Pope had the like offer made him of a doctor’s degree in law, which he seemed disposed to accept, until he learnt that some impediment had been thrown in the way of his friend’s receiving the compliment intended for him by the vice-chancellor. He then absolutely | refused that proposed to himself. “Mr. 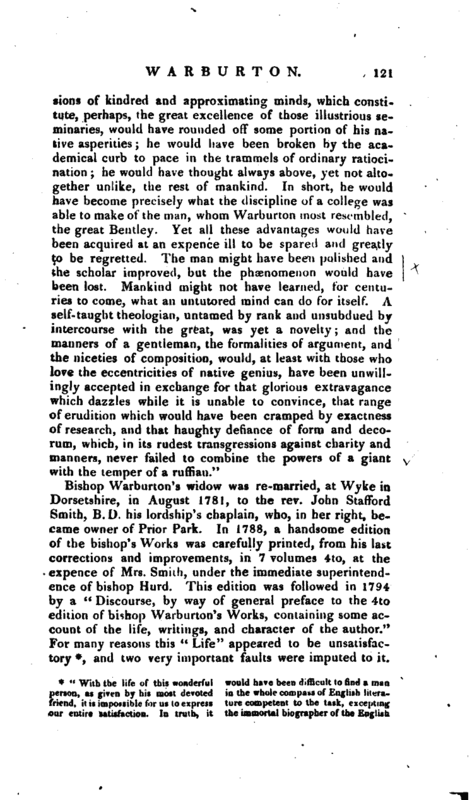 Pope,” says Hurd, “retired with some indignation to Twickenham, but consoled himself and his friend with this sarcastic reflection, ‘ We shall take our degree together in fame, whatever we do at the university?” This biographer also informs us that “the university seemed desirous of enrolling their narmes among their graduates,” but that “intrigue and envy defeated this scheme.” He adds, that this was “the fault of one or two of its (the university’s) members,” a number surely insufficient to produce such an effect. But the real history of this matter seems never to have been given. In the same year he published, 1. “A Letter from an author to a member of parliament, concerning Literary Property,” 8vo. 2. 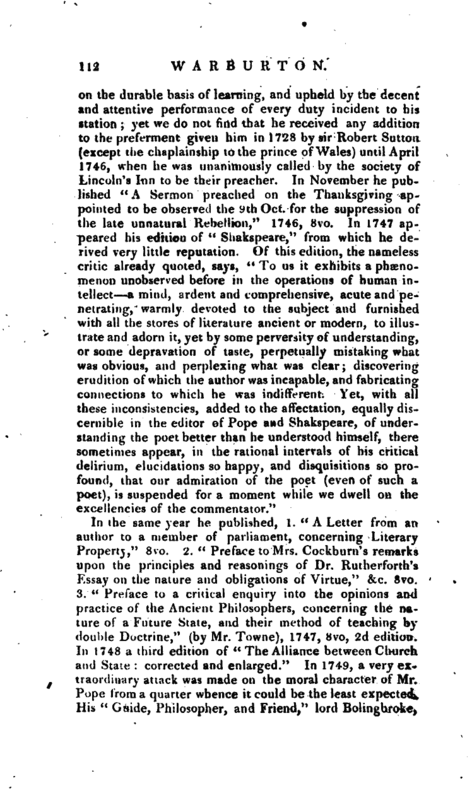 “Preface to Mrs. Cockburn’s remarks upon the principles and reasonings of Dr. Rutherforth’s Essay on the nature and obligations of Virtue,” &c. 8vo. 3. “Preface to a critical enquiry into the opinions and practice of the Ancient Philosophers, concerning the nature of a Future State, and their method of teaching by double Doctrine,” (by Mr. Towne), 1747, 8vo, 2d edition. In 1748 a third edition of “The Alliance between Church and State corrected and enlarged.” In 1749, a very extraordinary attack was made on the moral character of Mr. Pope from a quarter whence it could be the least expected. His “Guide, Philosopher, and Friend,” lord Bolingbroke, | published a book which he had formerly lent Mr. Pope in ms. 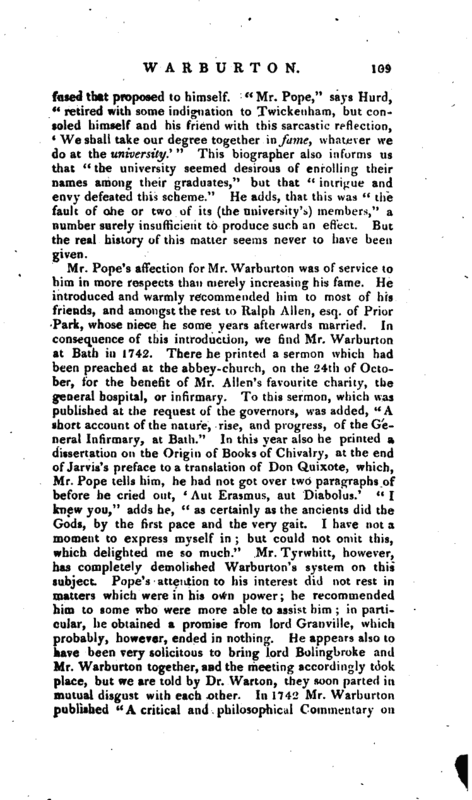 The preface to this work, written by Mr. Mallet, contained an accusation of Mr. Pope’s having clandestinely printed an edition of his lordship’s performance without his leave or knowledge. (See Pope.) A defence of the poet soon after made its appearance, which was universally ascribed to Mr. Warburton, and was afterwards owned by him. 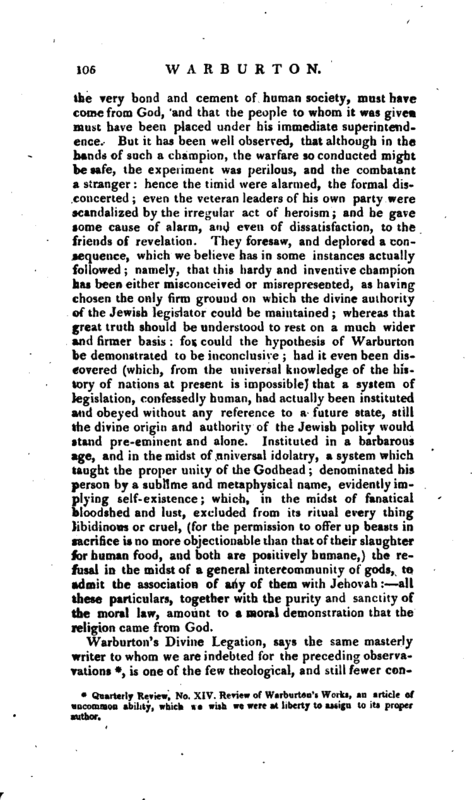 It was called “’A Letter to the editor of Letters on the Spirit of Patriotism, the Idea of a patriot King, and the State of Parties, occasioned by the editor’s advertisement;” which soon afterwards produced an abusive pamphlet under the title of “A familiar epistle to the most Impudent Man living,” &c. a performance, as has been truly observed, couched in Janguage bad enough to disgrace even gaols and garrets. 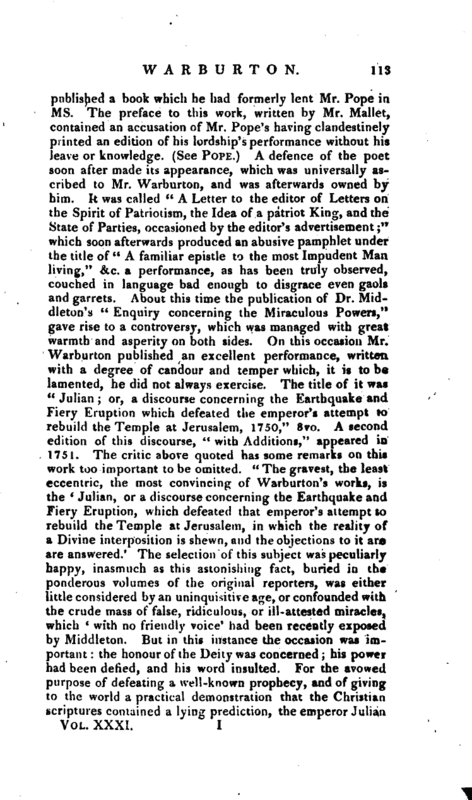 About this time the publication of Dr. Middleton’s “Enquiry concerning the Miraculous Powers,” gave rise to a controversy, which was managed with great warmth and asperity on both sides. 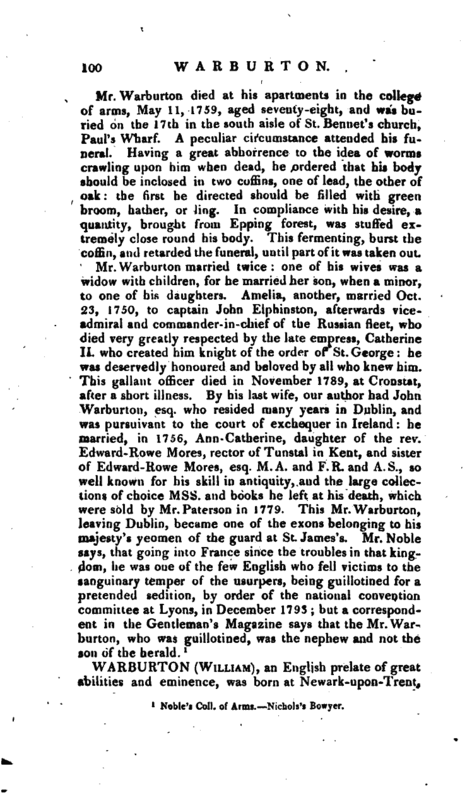 On this occasion Mr. Warburton puolished an excellent performance, written with a degree of candour and temper which, it is to be lamented, he did not always exercise. The title of it was “Julian or, a discourse concerning the Earthquake and Fiery Eruption which defeated the emperor’s attempt to rebuild the Temple at Jerusalem, 1750,” 8vo. A second edition of this discourse, <c with Additions,“appeared in 1751. 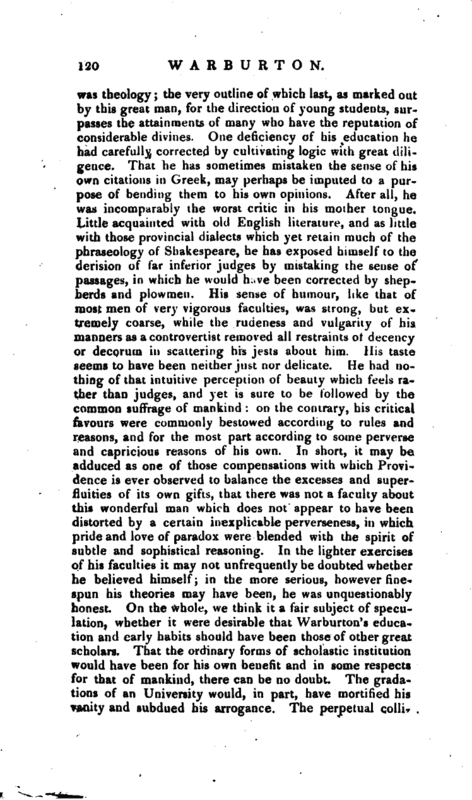 The critic above quoted has some remarks on this work too important to be omitted.” The gravest, the least eccentric, the most convincing of Warburton’s works, is the ‘ Julian, or a discourse concerning the Earthquake and Fiery Eruption, which defeated that emperor’s attempt to rebuild the Temple at Jerusalem, in which the reality of a Divine interposition is shewn, and the objections to it ar are answered/ The selection of this subject was peculiarly happy, inasmuch as this astonishing fact, buried in the ponderous volumes of the original reporters, was either little considered by an Uninquisitive age, or confounded with the crude mass of false, ridiculous, or ill-attested miracles, which “with no friendly voice” had been recently exposed by Middleton. But in this instance the occasion was important: the honour of the Deity was concerned; his power had been defied, and his word insulted. For the avowed purpose of defeating a well-known prophecy, and of giving to the world a practical demonstration that the Christian scriptures contained a lying prediction, the emperor Julian | undertook to rebuild the temple of Jerusalem; when, to the astonishment and confusion of the builders, terrible flames bursting from the foundations, scorched and repelled the workmen ’till they found themselves compelled to desist. Now this phenomenon was not, the casual eruption of a volcano, for it had none of the concomitants of those awful visitations: it may even be doubted whether it were accompanied by an earthquake; but the marks of intention and specific direction were incontrovertible. The workmen desisted, the flames retired, they returned to the work, when the flames again burst forth, and that as often as the experiment was repeated. 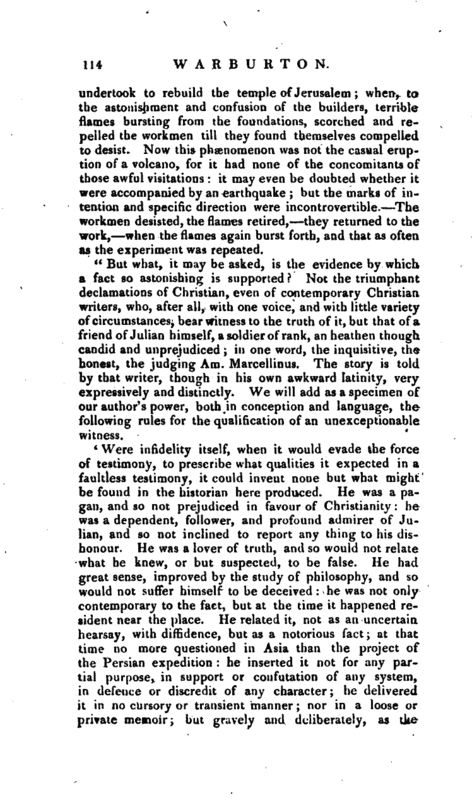 "But what, it may be asked, is the evidence by which a fact so astonishing is supported Not the triumphant declamations of Christian, even of contemporary Christian writers, who, after all, with one voice, and with little variety of circumstances, bear witness to the truth of it, but that of^ friend of Julian himself, a soldier of rank, an heathen though candid and unprejudiced; in one word, the inquisitive, the honest, the judging Am. Marcellinus. The story is told by that writer, though in his own awkward latinity, very expressively and distinctly. We will add as a specimen of our author’s power, both in conception and language, the following rules for the qualification of an unexceptionable witness. | April 30, 1767, before his royal highness Edward duke of York, president, and the governors of the London Hospital. &c.“4to, he closed his literary labours. His faculties continued unimpaired for some time after this period; and, in 1769, he gave the principal materials to Mr. Ruffhead, for his” Life of Mr. Pope." He also transferred 500l. 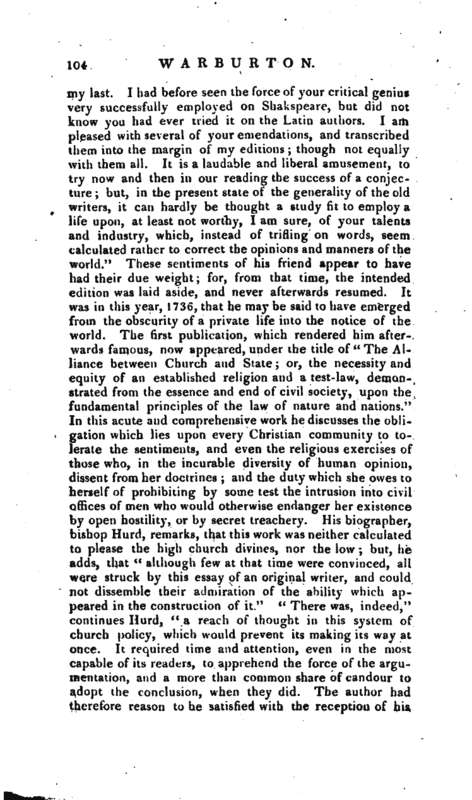 to lord Mansfield, judge Wilmot, and Mr. Charles Yorke, upon trust, to found a lecture in the form of a course of sermons; to prove the truth of revealed religion in general, and of the Christian in particular, from the completion of the prophecies in the Old and New Testament, which relate to the Christian church, especially to the apostacy of Papal Rome. To this foundation we owe the admirable introductory letters of bishop Hurd and the well- adapted continuation of bishops Halifax and Bagot, Dr. Apthorp, the Rev. R. Nares, and others. It is a melancholy reflection, that a life spent in the constant pursuit of knowledge frequently terminates in the loss of those powers, the cultivation and improvement of which are attended to with too strict and unabated a degree of ardour. This was in some degree the misfortune of Dr. Warburton. Like Swift and the great duke of Marlborough, he gradually sunk into a situation in which it was a fatigue to him to enter into general conversation. There were, however, a few old and valuable friends, in whose company, even to the last, his mental faculties were exerted in their wonted force; and at such times he would appear cheerful for several hours, and on the departure of his friends retreat as it were within himself. This melancholy habit was aggravated by the loss of his only son, a very promising young gentleman, who died of a consumption but a short time before the bishop himself resigned to fate June 7, 1779, in the eighty-first year of his age. A neat marble monument has been lately erected in the cathedral of Gloucester, with the inscription below *. see. the Church of England. of the most sublime Genius, and Dec. 24, 1698.
exquisite Learning. Was consecrated Bishop of Glou­ Both which taleuts cester, Jan. 20, 1760. | Dr. Johnson’s character of this literary phenomenon is too remarkable to be omitted. 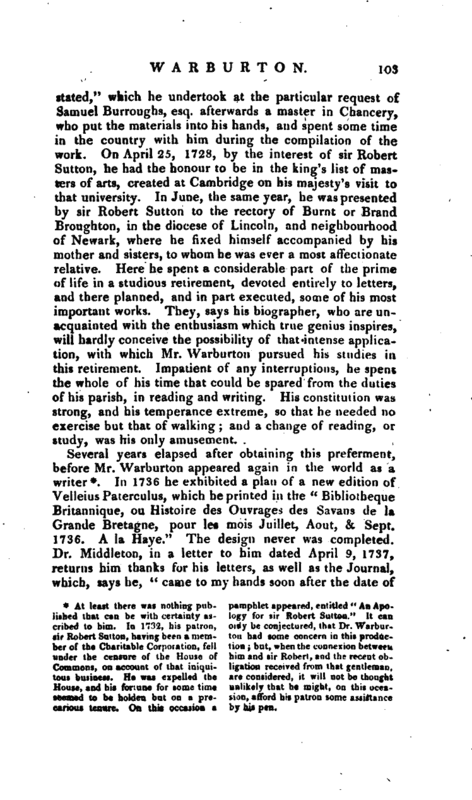 “About this time (1738), Warburton began to make his appearance in the first ranks of learning. He was a man of vigorous faculties, a mind fervid and vehement, supplied by incessant and unlimited inquiry, with wonderful extent and variety of knowledge, which yet had not oppressed his imagination nor clouded his perspicacity. To every work he brought a memory full fraught, together with a fancy fertile of original combinations; and at once exerted the powers of the scholar, the reasoner, and the wit. But his knowledge was too multifarious to be always exact, and his pursuits were too eager to be always cautious. His abilities gave him a haughty consequence, which he disdained to conceal or mollify; and his impatience of opposition disposed him to treat his adversaries with such contemptuous superiority as made his readers commonly his enemies, and excited against the advocate the wishes of some who favoured the cause. He seems to have adopted the Roman emperor’s determination, ‘oderint dum metuant;’ he used no allurements of gentle language, but wished to compel rather than persuade. His style is copious without selection, and forcible without neatness; he took the words that presented themselves: his diction is coarse and impure, and his sentences are unmeasured.” To this character, which has been often copied, we shall subjoin some remarks from the able critic of whom we have already borrowed, and whose opinions seem entitled to great attention. poets. To any writer of his own school, as such, there were certain general objections, and against every individual in the number, particular exceptions might be taken. In tl<e first place, the prejudices of the whole body were excessive, and their views of the subject narrow and illiberal in the extreme. In an age of ability and learned independence, they had erected their leader into a monarch of literature, and whoever presumed to contest his claim was, Without ceremony, sacrificed to it, while with the rancour which ever pursues this single species of delinquency, the mangled limbs of the departed enemy were held up with savage derision to the scorn or commiseration of mankind. “But even among the disciples of the Warburtonian school, Hurd assuredly was not the man whom we should have wished to select for the delicate and invidious task of embalming his patron’s remains. Subtle and sophistical, elegant, but never forcible, his heart was cold, though his admiration was excessive. He wanted that power of real genius, which is capable of being fired by the contemplation of excellence, till it partakes of the heat and flame of its object. On the other hand, he wanted nothing of that malignity which is incident 10 the coolest tempers, of that cruel and anatomical faculty, which, in dissecting the character of an antagonist, can lay bare, with professional indifference, the quivering fibres of an agonized victimFor this purpose his instrument was irony; and few practitioners have ever employed that, or any other, more unfeelingly than did the biographer of Warburton, even when the ground of complaint was almost imperceptible, as in the cases of —Leland and Jortin. 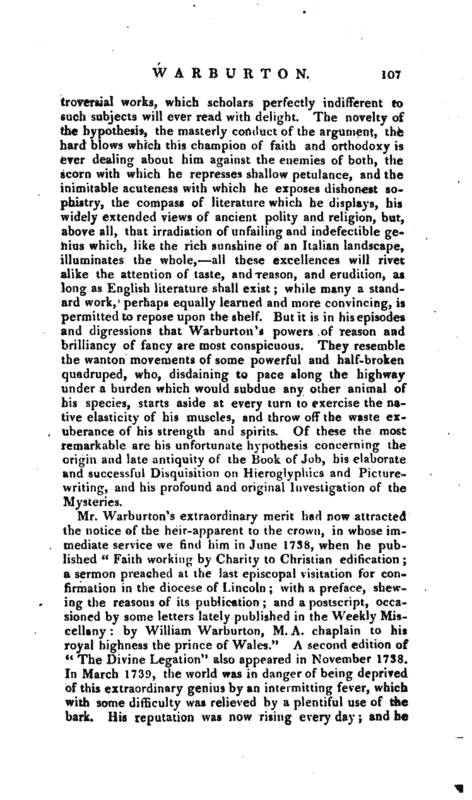 ”To the author of the Delicacy of Friendship, however, the office of bio grapher to Warburlon, whether wisely or otherwise, was in fact consigned; and it cannot be denied, that he has executed his task in a style of elegance and purity worthy of an earlier and better age of English literature." Quarterly Review, ubi supra. Life by Kurd. Nichols’s Literary Anecdotes. Quarterly Review, No. XIV. 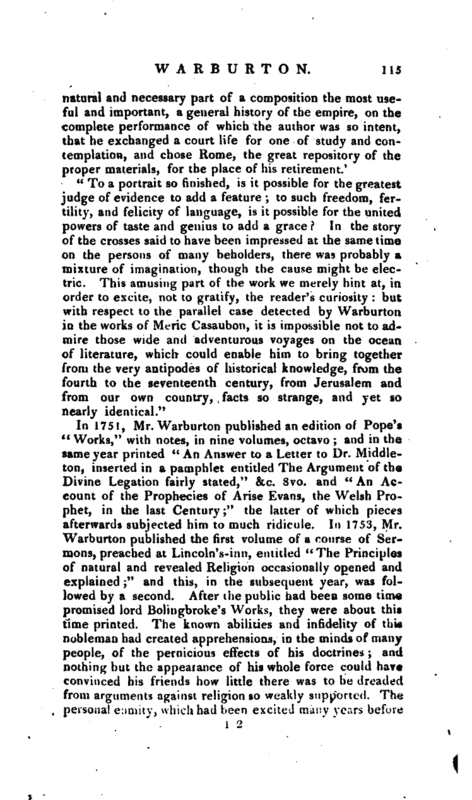 in the review of the octavo edition of Warburton’s Works, published in 1811.